The rolling hills and winding valleys of the Belgian Ardennes are always a pleasant sight. Like last year, it certainly creates a great sense of anticipation for the events that would unfold over the next few days. But the weather this year coming into Radhadesh was truly bizarre. There was no welcoming sunshine this year! Instead, it was distinctly chilly and strangely, the fields, trees and roofs of all the village houses were covered with a sparse layer of snow; at the end of April! Nonetheless devotees weren’t fazed by the elements. 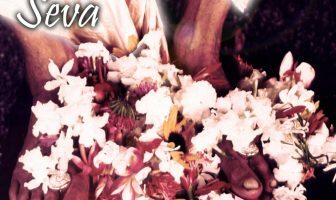 Connecting with vaishnava philosophy makes one only too aware of the imperfections of this world we live in. 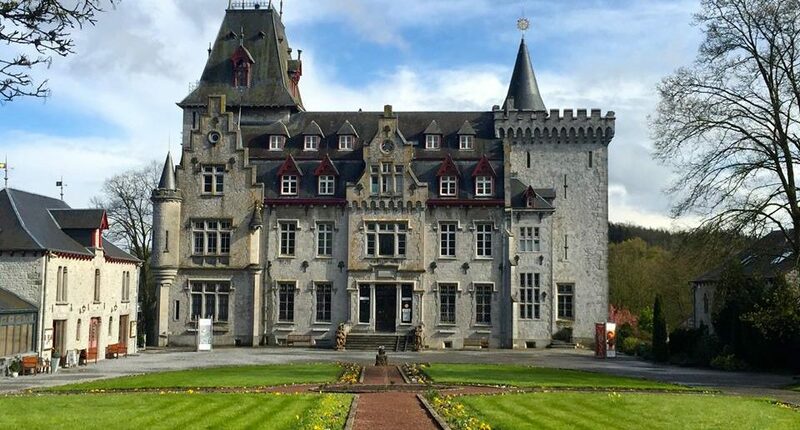 Despite the diabolical climate, driving up the meandering road and catching first sight of the Radhadesh Chateau is always such a stately view. What to speak of the inside! Gigantic and exquisite chandeliers, gold painted motifs on ornate ceilings, a majestic marble type staircase and of course, the generous display of Krsna lila paintings adorning the walls. The overall effect is stunning and we are still only in the reception. Soon we find ourselves taking darshan of their gorgeous Lordships, Sri Sri Radha Gopinatha; Sri Sri Jagannath, Baladev, Subadhra; and Sri Sri Gaura Nitai! Philosophically speaking, we don’t actually take darshan of them. It is said that we are there to be seen by them. After all, what can we see with our mundane eyes? (I speak for myself here). And yet, when glancing upon the astonishing sight of the deities with their beauty, dazzling splendour and cuteness; one cannot help but feel moved by the sight. There is definitely something in viewing the deities that goes beyond the censorship of reason and logic. Even for a neophyte like myself. 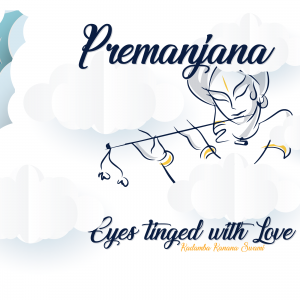 Soon enough, rooms were allocated; luggage laid out, loving pleasantries exchanged with devotees not seen for a while and delicious prasadam honoured. 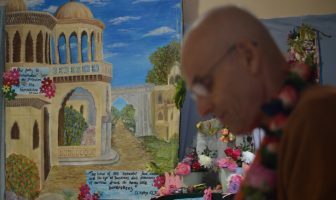 After our motley crew of British devotees settled in, there was only thing on our minds; meet HH Kadamba Kanana Swami Maharaj! Maharaj was staying in the nearby college building. The weather outside was cold and drizzly, but as soon as Nimai (Maharaj’s young German servant) opened the door, it was like walking into a sauna – hot and steamy to the max. Maharaj looked at us with his priceless grin; while we we’re are all beaming from cheek to cheek. ‘We’ meaning Sesa (cerebral yet childlike), Ganesh (dynamic and always in fifth gear), Gurudas (gregarious, exuberant and ‘larger than life’!) and myself. We all lumbered in one by one and immediately sat on the soft rug while Maharaj sat on his chair. Maharaj’s desk was covered with various Gaudiya vaishnava literatures. In the middle of it, there was also a huge book on what seemed to be an anthology and history of Western philosophical thought. Some of us mentioned whether the temperature was a bit too hot for Maharaj, but he just gave a nonchalant shrug. Better having it hot then dealing with crazy weather outside. Inevitably the question of Maharaj’s health came up. As soon as health was mentioned, Maharaj had that expression of, “Here we go again! !” He must have heard this question a million times by now. Nonetheless he graciously explained his situation – a wound resulting from Maharaj’s illness is not fully healed yet, his iron levels are still rather low and there is still some occasional dizziness, suffice to say he still needs to take it easy. He is definitely not out of the woods yet. A lot of devotees may have initially felt a little disappointment knowing Maharaj won’t physically be on the Kingsday parade but considering his state of health, this could only be a good thing. Externally Maharaj seemed rather perky but he still needs plenty of rest. It was good to know that he would be going to stay at an Ayurvedic farm in South India for a few weeks after this short trip to Europe. Talk soon came up of how Ganesh will soon be moving up to the Karuna Bhavan temple in Scotland. Maharaj looked at him and mentioned he is a livewire, and how he needs fresh challenges to keep him going. Everyone in the room nodded in agreement and smiled. 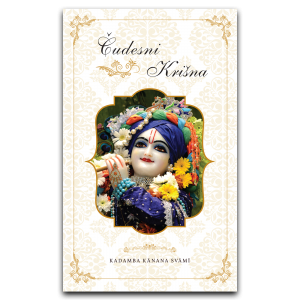 Maharaj then explained that ultimately to thrive in Krsna consciousness, you have to be yourself for Krsna and situated in one’s nature, doing things that you like to do. You can be someone else for Krsna only for so long before the whole thing gets lifted. Therefore one has to eventually be oneself completely for Krsna. As mentioned before, a few devotees expressed their sadness that Maharaj wouldn’t be there for the Kingsday parade. Some even suggested staying back to be with Maharaj but Maharaj wasn’t having any of it. Everyone has to go to Kingsday parade; the show must go on. Maharaj then reassured how it will still be a real belter for everyone, what with the likes of fantastic kirtaneers such as Lokanatha Maharaj and Vraja Krsna Prabhu coming along!! The kirtan started off beautifully – slow and mellow. It felt good, Maharaj wasn’t doing anything elaborate, just keeping it nice and simple but nudging us slowly, slowly to get more into it. Then as the kirtan progressed, it was going deeper and deeper. With the depth, the intensity also started to increase more and more… until it reached its zenith and everybody was up on their feet dancing wildly. 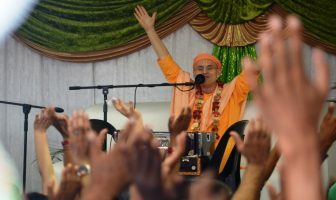 By this time, Maharaj was giving it hard-core on the microphone. At that point, I felt like I was in a state of pure chanting. Nothing else was coming into my mind. I was really crying out for the mantra because of Maharaj’s inspiration. Even when Maharaj was bringing down the intensity so it became less upbeat, the chanting just became more meditative. Everyone was just singing from the heart. I found myself chanting with more clarity and focus and this was aiding my ability to call out for more service for Krsna. The funny thing is, after the kirtan finished, I was approached to do some special service in the morning for the Vyasa Puja. So Krsna really reciprocated with my desires thanks to Maharaj’s heart stirring kirtan!!! 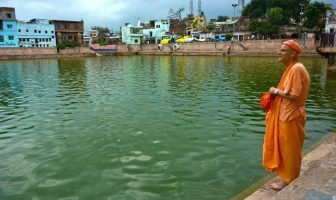 HH Kadamba Kanana Swami Maharaj ki Jai! Thank you for your kind words. I hope you will keep following KKSBlog. Soon we will have the recordings from the Vyasa-puja festival!